Maddie and her husband Aaron share in the thrill of meeting a snowy owl in January 2018. I love the birds of winter. The busyness at our feeders, the high-flying rough-legged hawks that silently cast shadows over the still, white landscape, and, if we’re lucky, the short-eared and snowy owls. I will never forget the night that Mark sent me and Caleb, a former intern, out to do one last owl scout at the end of a bitterly cold day in December. We drove around for the better part of an hour with no luck. Then, pausing up near the UW quarry, in one of those happy twists where the rock you thought you saw turns out to be an owl, Caleb spotted a short-eared owl hunkered down on a fencepost. A moment later we saw another short-ear glide silently over the same field. This was enough to buoy us and as it was very nearly dark, we started to head back to the house. On our way we drove past the pond and the snags of cottonwoods that hug the east pond. It took us a moment to realize that we had driven right past a snowy owl sitting on the shorter snag. We carefully backed up and observed it for a moment before it flushed, and flew over the west pond to land on the ice, alarming the few brave Canada geese that remained this late in the season. In a matter of minutes a seemingly fruitless owl prowl had turned into a threefold sighting. As spring arrives, the pond floods with waterfowl and the birds begin to brush up on their dancing in preparation for mating season. It’s always a joy to see the sandhill cranes hopping, bowing, and sweeping their huge graceful wings for their mates. Likewise, the drama of the northern harrier skydance is hard to beat. All this bravado leads to the happy observations of early summer. I can recall one morning when, all alone and heading up the trail in the Kubota, I saw a hen turkey up ahead on the trail. I stopped the vehicle and sat still to watch 10, 11, 12, 13 or more turkey chicks stumble across the trail, the last one dawdling well behind the others, until it looked up and, seeing itself alone, took off like a shot into the tall grasses. Another unforgettable family moment was when, working with the interns, we flushed a female harrier. Approaching the area where she flew, we were treated to the sight of her nest, complete with two feisty chicks who glared up at us with open bills before dashing off the nest and into the prairie at surprising speed. We took off with speed ourselves so as not to disturb them further. 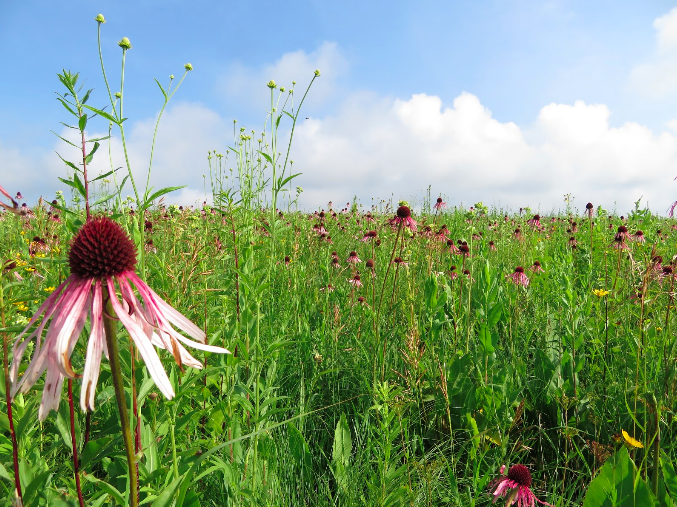 In the heat of summer, the prairie wildflowers are the pleasantest way of marking the passing of the season. Unfortunately, the invasive weeds are just as regular a timepiece. Well past parsnip season and deep into the drudgery of sweet clover season, a late afternoon can drag on slower than your feet through the lush prairie as you fight your way out to an isolated clone. It’s there, digging and pulling and sweating and hoping you’ve found the last of it (and you never have), that the sweet call of the Eastern meadowlark might make you pause. You will look around for the bird, and maybe spot it, or maybe not. But either way, that momentary lapse in your single-minded pursuit has caused you to observe the beauty around you. The call of the meadowlark reminds you why you’re there in the sweetest way possible. In fall the waterfowl return to the pond in full force. Every morning is a scavenger hunt, counting the birds on the pond, feeling that rush of adrenaline when you spot something new (a raft of redheads! ), or in great quantities (100 snow geese!). Even better, long satisfying days collecting and sorting prairie seed blend into cool, dark nights where the last sounds you hear before falling asleep are the honking and splashing and whistling of the ducks, geese and swans. One fall night Aaron and I heard a great-horned owl hooting around dusk, a pack of coyotes yipping in the middle of the night, and a pheasant barking us awake in the morning; all this vying to be heard over the cacophony coming off the pond. Whoever said it was quiet living in the country?! These experiences will forever mark a special time in my life. A time when my job meant spending the entire day outside in nature. When my work and home and passion all blended harmoniously into one. I will continue to work in the field of restoration ecology, but I don’t know when I’ll ever again be so immersed in it. May everyone be so fortunate as to have a job like this once in their lives. Thank you to everyone who gave me this opportunity, to those who livened my days by working with me, to those who educated me (whether they knew it or not), and to all who work to protect our wildlife and planet.